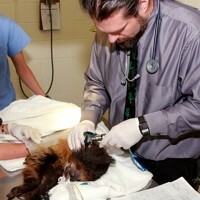 If you were a child who liked animals, chances are high that you thought at one point you wanted to be a veterinarian. Our speaker at our March 1, 2013 Open Minds Café in Raleigh, NC was someone who actually achieved that dream: Dr. Dan Dombrowski, Chief Veterinarian at the North Carolina Museum of Natural Sciences. 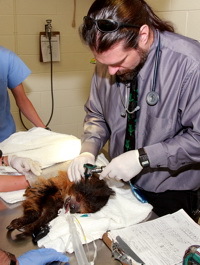 At the NCMNS, Dr. Dombrowski practices Wildlife, Avian, Aquatics, & Zoo Medicine (WAAZM) as he treats the animals of the museum’s Living Collections, from the Madagascar hissing cockroaches used in outreach programs to the two-toed sloth that resides in the Living Conservatory exhibit. He also came to us with plenty of public speaking experience, as he does procedures in the NCMNS’s Window on Animal Health every day. Dr. Dombrowski presented a talk to the teens about the various animal groups someone in his profession can work with, the weird procedures someone in his line of work performs, and the everyday experiences of a museum vet. His presentation was full of photos from his past procedures and even included a video taken of urolith removal surgery he performed on a waxy monkey frog. We had many teens show up who are considering a career in veterinary medicine and took advantage of the opportunity to hear about the job from a professional. He also wrote animal trivia questions and interspersed them throughout his presentation, and the teens teamed up by table to answer them and compete for a prize. Dr. Dombrowski wrote a series of challenging trivia questions about the types of animals he works with as a museum veterinarian and posed them to the teens throughout the presentation. This meant that the activity portion of the Café was split up throughout the time, instead of offered at the end. After his presentation, he fielded questions while the youth and adult leaders graded the answer sheets, and then the winning teams were awarded prizes. Dr. Dombrowski also brought a few skeletal specimens used in teaching and kept them at the front of the room. The teens were encouraged to check them out after the talk, while he stood by them and answered questions about the specimens and his job.